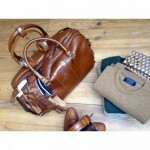 Herring Bovey is a sumptuous weekend bag made with superb tan calf leather. There is a strap as well as the two handles to make it easy to carry and it comes with a luggage tag. 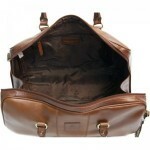 Inside you will find two large pockets with velcro fastening flaps and a large zip pocket. 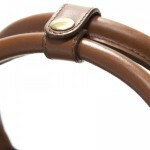 There is even a small fastener so you can fasten the two handles together. On the bottom there are some brass studs to prevent the bottom from wearing excessively. Please note the tan colour varies according to the lighting so the image is a guide only. 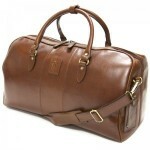 "A quality leather holdall bag at a fraction of the cost of so many high end bags on the market. 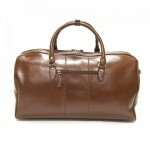 It really is beautifully finished leather with brass metalware and comes with a dustbag to protect it. I highly recommend one for weekend trips!" 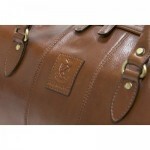 "This bag looks nice, but the leather seems a little cheap compared to other Herring products. I think it's been discontinued, so maybe that's why.."
"Bought these bags to carry legal briefs as criminal defence - heavy loads and has held up well and gets better with age"